"Fish is on!" A sport fisherman reels in a big one. Fishing is the practice of catching wild fish for food, recreation, trade, or their products. Methods used include hooking, trapping, and gathering. By extension, the term fishing is applied to catching such other aquatic animals as shellfish, squid, octopus, turtles, frogs, and some edible marine invertebrates. The term is usually not applied to the catching of such aquatic mammals as whales, for which the term "whaling" is more appropriate. 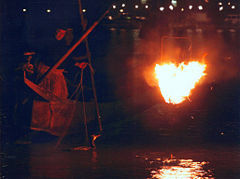 Fishing is an ancient and worldwide practice with various techniques and traditions. Modern fishing practices range from commercial ships harvesting food fish on a large scale to individuals catching a few fish for a family dinner, and from recreational trout stream fishing to professional deep-sea sport fishing. Recreational fishing is much more than a game. It is a unique activity that can enhance a personal sense of balance, strengthen intergenerational family relationships, deepen appreciation of the complex order and harmony of the natural world, and instill a sense of wonder and humility in the face of it all. Fishing can be filled with excitement, joy, and thrill often in awesome natural environments. Pursuing creatures living unseen beneath the surface of the water induces in many people a particular calming state of focus and awareness that then shifts dramatically in the moment the fish strikes the line. Fishing is a unique activity that can be pursued as a hobby, a way of acquiring food for subsistence, or as a commercial profession. It can include elements of joy, excitement, and hope intermingled with what is often a bloody, dirty, smelly, and physically demanding activity. Because recreational fishing can engage the interest of young and old, male and female, it provides a context for strengthening bonds within families. Various methods of catching fish have been developed by trial and error backed by research, with individuals, whether recreational or commercial, often developing a theory of how to catch fish based on years of experiences. Since the behavior of fish is affected by the constantly changing aquatic environment, fishing requires continuous ecological study and research. Currently, the deterioration of the earth's natural environments threatens the existence of marine life. For the sustainable development of fishing, international cooperation in fish management and research is indispensable. Fishing is an ancient practice dating back at least 10,000 years to the beginning of the Mesolithic period. Archaeological features such as shell middens, discarded fish bones, and cave paintings from that period show that sea foods were important for survival and consumed in significant quantities. During this period, most people lived a hunter-gather lifestyle and were, of necessity, constantly on the move. However, where there are early examples of permanent settlements (though not necessarily permanently occupied) such as those at Lepenski Vir, they are almost always associated with fishing as a major source of food. Later, between 8000 and 4000 years ago, when the Neolithic culture spread worldwide bringing with it new technologies of farming and pottery, it also brought the basic forms of all the main fishing methods that are still used today. The ancient river Nile was full of fish; fresh and dried fish were a staple food for much of the population. The Egyptians invented various implements and methods for fishing and these are clearly illustrated in tomb scenes, drawings, and papyrus documents. Simple reed boats served for fishing. 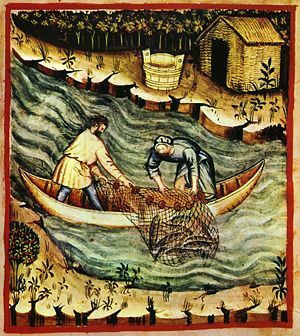 Woven nets, weir baskets made from willow branches, harpoons, and hook and line (the hooks having a length of between eight millimeters and eighteen centimeters) were all being used. 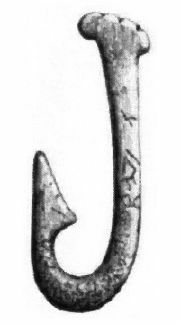 By the 12th dynasty, metal hooks with barbs were being used. As is fairly common today, the fish were clubbed to death after capture. Nile perch, catfish, and eels were among the most important fish. Some representations hint at the pursuit of fishing as a pastime. Pictorial evidence of Roman fishing comes from mosaics portraying people fishing from boats using rod and line as well as nets. Various species such as conger, lobster, sea urchin, octopus, and cuttlefish are illustrated. 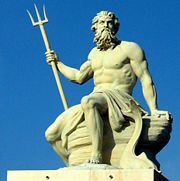 One Roman parody of fishing involved a type of gladiator called the retiarius who was armed with a trident and a casting-net. He would fight against another type of gladiator, the murmillo or "fish-man," who carried a short sword and a helmet with the image of a fish on the front. Ancient literature includes numerous references to fishing. In most cases, however, the descriptions of nets and fishing gear do not go into detail. An early example from the Bible in Job 41:7: Canst thou fill his skin with barbed irons? or his head with fish spears?. The Greek historian Polybius (203–120 B.C.E. ), in his Histories, describes fishing for swordfish by using a harpoon with a barbed and detachable head. The fishers set up very light nets of buoyant flax and wheel in a circle round about while they violently strike the surface of the sea with their oars and make a din with sweeping blow of poles. At the flashing of the swift oars and the noise, the fish bound in terror and rush into the bosom of the net which stands at rest, thinking it to be a shelter: foolish fishes which, frightened by a noise, enter the gates of doom. Then the fishers on either side hasten with the ropes to draw the net ashore. From ancient representations and literature it is clear that fishing boats were typically small, lacked a mast or sail, and were used only in close to the shore. In traditional Chinese history, history begins with three semi-mystical and legendary individuals who taught the Chinese the arts of civilization around 2800–2600 B.C.E. : of these Fu Hsi was reputed to be the inventor of writing, hunting, trapping, and fishing. It is possible to fish with minimal equipment by using only the hands. In the British Isles, the practice of catching trout by hand is known as trout tickling; it is an art mentioned several times in the plays of Shakespeare. Trout binning is a method of fishing, possibly fictional, performed with a sledgehammer. Divers can catch lobsters by hand. Pearl diving is the practice of hunting for oysters by free-diving to depths of up to 30 meters. 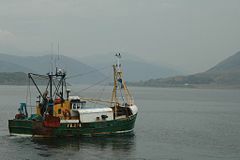 When applied to the collection of scallops or oysters from the seabed, the dredging process often has involved a fishing boat towing a scoop made of chain mesh across the sea floor. Scallop dredging is very destructive to the seabed, because the marine life is unable to survive the weight of the dredge. This is extremely detrimental to coral beds since they take centuries to rebuild themselves. Dredging could be compared to unmonitored forest clearing, where it can wipe out an ecosystem. Nowadays, this method of fishing is often replaced by mariculture or by scuba diving to collect the scallops. Spear fishing is an ancient method of fishing and may be conducted with an ordinary spear or a specialized variant such as an eel spear or the trident. A small trident-type spear with a long handle is used in the American South and Midwest for "gigging" bullfrogs with a bright light at night, or for gigging carp and other fish in the shallows. Traditional spear fishing is restricted to shallow waters, but the development of the speargun makes the method much more efficient and permits spear fishing in deeper waters. With practice, divers are able to hold their breath for up to four minutes and sometimes longer; of course, a diver with underwater breathing equipment can dive for much longer periods. Kite fishing is presumed to have been first invented in China. It was, and is, also used by the people of New Guinea and other Pacific Islands—either by cultural diffusion from China or independent invention. Kites can provide boatless fishermen access to waters that would otherwise be available only to boats. Similarly, for boat owners, kites provide a way to fish in areas where it is not safe to navigate such as shallows or coral reefs where fish may be plentiful. 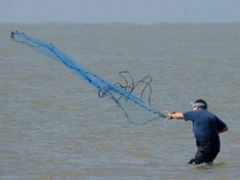 Kites can also be used for trolling a lure through the water. Modern kite fishing is popular in New Zealand, where large delta kites of synthetic materials taking a line and hooks far out past the breakers are used to fish from beaches. Kite fishing is also emerging in Melbourne where sled kites are becoming popular, both off beaches and off boats and in freshwater areas. Members of the disabled community are increasingly using kites for fishing, as the kites allow them to cast the bait further out than they would otherwise be able to do. Fishing nets, which are used to enclose fish, are made in a wide variety of styles and sizes depending on the origin and intended use. Landing nets, for example, are used to hold the fish once it is pulled in. Fishing nets have been made for thousands of years based on the particular materials at hand that can be formed into a relatively thin, strong thread and made into a mesh, which is often knotted. Modern nets are usually made of artificial polyamides like nylon, although nets of organic polyamides such as wool or silk thread were common until recently and are still used in certain areas. Ice fishing is the practice of catching fish with lines and hooks through an opening in the ice on a frozen body of water. It is practiced by hunter-gatherers such as the Inuit and by recreational anglers in cold or continental climates. Indigenous Australians were, prior to European colonization, most populous in Australia's better-watered areas such as the Murray-Darling river system of the southeast. Here, where water levels fluctuate seasonally, indigenous people constructed ingenious stone fish traps. Unfortunately, most have been completely or partially destroyed. The largest and best known were the Brewarrina fish traps on the Barwon River at Brewarrina in New South Wales. The Brewarinna fish traps caught huge numbers of migratory native fish as the Barwon River rose in flood and then fell. In southern Victoria, indigenous people created an elaborate systems of canals, some more than 2 km long. The purpose of these canals was to catch eels, a fish of short coastal rivers (as opposed to rivers of the Murray-Darling system). The eels were caught by a variety of traps including stone walls constructed across canals with a net placed across an opening in the wall. Traps at different levels in the marsh came into operation as the water level rose and fell. Somewhat similar stone wall traps were constructed by native American Pit River people in north-eastern California. A technique called dam fishing is used by the Baka pygmies. This involves the construction of a temporary dam resulting in a drop in the water levels downstream—allowing fish to be collected easily. Basket weir fish traps were widely used in ancient times. They are shown in medieval illustrations and surviving examples have been found. Basket weirs are about 2 meters long and comprise two wicker cones, one inside the other—easy to get into and hard to get out. The Wagenya people, in the Democratic Republic of Congo, build a huge system of wooden tripods across the river. These tripods are anchored on the holes naturally carved in the rock by the water current. To these tripods are anchored large baskets, which are lowered into the rapids to "sieve" the waters for fish. It is a very selective fishing, as these baskets are quite big and only large size fish are trapped. Twice a day the adult Wagenya people pull out these baskets to check whether there are any fish caught; in which case somebody will dive into the river to fetch it. In the Great Lakes Region of the United States of America, Fishermen submerse a long, visible mesh wall running perpendicular to the shoreline that guides fish (who instinctively swim toward deeper water when coming upon a large obstacle) into a maze that ends in a large mesh "pot," that can be raised up to the boat to haul the fish in. This method of fishing results in fish staying alive until the time they are hauled into the boat, versus being entangled and killed in a gill net. This method also allows for sportfish and other protected species to be released without harm. Pot traps are typically used to catch crustaceans such as crabs, lobsters, and crayfish. Pot traps such as the lobster trap may be constructed in various shapes; each is a box constructed to have a convoluted entrance that makes entry much easier than exit. The pots are baited and lowered into the water and checked frequently. Similar traps are also used in many areas for capturing bait fish. Historically lobster pots were constructed of wood. Today most traps are made from checkered wire and mesh. It is common for the trap to be weighted down with bricks. A bait bag is hung in the middle of the trap. In theory, the lobster walks up the mesh and then falls into the wire trap. Bait varies from captain to captain, but it is common to use herring. 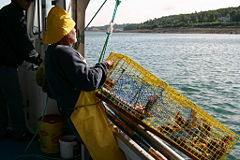 In commercial lobstering, five to ten of these traps will be connected with line. A buoy marks each end of the string of pots. Two buoys are important to make retrieval easier and so captains don't set their traps over each other. Each buoy is painted differently so the various captains can identify their traps. The practice of tethering a remora, a sucking fish, to a fishing line and using the remora to capture sea turtles probably originated in the Indian Ocean. The earliest surviving records of the practice are Peter Martyr d'Anghera's 1511 accounts of the second voyage of Columbus to the New World (1494). However, these accounts are thought to be apocryphal, and based on earlier, no longer extant accounts from the Indian Ocean region. Many hunter-gatherer cultures use poisonous plants to stun fish so they become easy to collect by hand. Some of these poisons paralyze the fish, others are thought to work by removing oxygen from the water. Cyanides are used to capture live fish near coral reefs for the aquarium and seafood markets. This type of illegal fishing, occurring primarily in or near the Philippines, Indonesia, and the Caribbean, supplies the 2 million marine aquarium owners in the world. Many fish caught in this fashion die either immediately or in shipping. Those that survive often die from shock or from massive digestive damage. The high concentrations of cyanide on reefs harvested in this fashion damage the coral polyps and have also caused cases of cyanide poisoning among local fishermen and their families. Dynamite or blast fishing, is done easily and cheaply with dynamite or homemade bombs made from locally available materials. The process is simple and deadly effective, as the shock from the blast indiscriminately kills large numbers of fish and other marine organisms in the vicinity and can damage or destroy the physical environment. The dead fish can be collected readily because they either float to the surface or sink to the bottom. Blast fishing is illegal in many waterways around the world, but enforcement is difficult and the practice continues. A relatively new fishing technique, electrofishing, is typically used for stream classification surveys and catching brood stock for hatcheries, or making estimates of populations in a body of water. In this process, which is based on the mechanism in the fish of galvanotaxis, a series of carefully-calibrated pulses of direct current induces muscular contractions in the fish causing them to face and swim toward the source of the electrical pulses. If the voltage is too low or the pulses too short with long gaps, the fish swim away from the source, and if the voltage is too high or the pulses too long with short gaps the fish can experience galvanonarcosis, or unconsciousness. Setting pulse length, pulse patterns, and current level so as to catch fish effectively without killing or injuring them requires great skill. Some of the complicating factors include: dissolved minerals in the water, which can decrease water resistance and cause less of the current to pass through the fish; fish that have only recently entered fresh water from the ocean have high salinity and are more prone to electric shock; and the smaller the fish the higher the current required to produce galvanotaxis because they have relatively less surface area in contact with the water. Smaller fish also require shorter pulses, closer together, while large fish should have longer pulses at lower power and longer gaps between pulses. Recreational fishing and the closely related (nearly synonymous) sport fishing describe fishing for pleasure or competition. 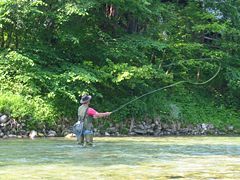 The practice commonly involves the use of a hook to attempt to catch fish, in which case the term angling also is applied. Recreational fishing has conventions, rules, licensing restrictions, and laws that limit the way in which fish may be caught. The International Game Fishing Association (IGFA) makes and oversees a set of voluntary obligations. Typically, these prohibit the use of nets and the catching of fish with hooks not in the mouth. Enforceable regulations are put in place by governments to ensure sustainable practice amongst anglers. For example in the Republic of Ireland, the Central Fisheries Board oversees the implementation of all angling regulations, which include controls on angling lures, baits, and number of hooks, as well as licensing regimes and other conservation based restrictions. Spinning reel. 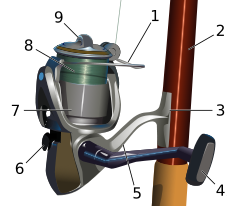 1: Pick up or bail 2: Reel seat 3: Reel foot 4: Handle 5: Support arm 6: Anti-reverse lever 7: Skirted spool 8: Fishing line 9: Drag adjustment knob. The most common form of recreational fishing is done with a rod, reel, line, hooks, and any one of a wide range of baits. Other devices, commonly referred to as terminal tackle, are also used to affect or complement the presentation of the bait to the targeted fish. Some examples of terminal tackle include weights, floats, and swivels. Lures are frequently used in place of bait. Most types of fishing tackle are made in a professional manufacturing facility while others are hand made by hobbyists who find greater satisfaction in catching fish with tackle made by themselves. Some examples of handmade tackle include plastics shaped in molds and flies. In addition to capturing fish for food, recreational anglers also enjoy keeping a log of fish caught and submitting trophy sized fish to independent record keeping bodies. In the Republic of Ireland, the Irish Specimen Fish Committee verifies and publicizes the capture of specimen (i.e. trophy) fish caught on rod and line by anglers in Ireland, both in freshwater and at sea. The Committee also ratifies Irish record rod caught fish. It also maintains a set of 'fair play' regulations to ensure fish are caught in accordance with accepted angling norms. One method of growing popularity, kayak fishing, involves fishing from sea kayaks in an attempt to level the playing field with fish and to further challenge the anglers' abilities. Kayaks are extremely stealthy and can allow anglers to reach areas unfishable from land or by conventional boat. In angling, it is sometimes expected or required that all fish be returned to the water (catch and release). The practice, however, is viewed by some with disapproval as they consider it unethical to inflict pain on a fish for fun or sport and not for reasons of capturing food. Anglers deny this charge, pointing out that fish commonly feed on hard and spiky prey items, and as such can be expected to have tough mouths, and also that some fish will re-take a lure they have just been hooked on, a behavior that is unlikely if being hooked were painful. There is also some research showing that certain types of fish such as catfish, do not have nerves around their mouth, most likely due to the fact that they eat animals such as crawfish that can pinch. In a real sense, the suitability of catch and release is an ethical consideration and, as such, a science-based conclusion on the issue is unavailable. Scientific studies show a wide range of survival rates after a fish is caught and released, depending on the species, environmental conditions, fish density, and research design (methodology). The difficulty of doing such experiments is closely linked to the fact that negative effects of repetitive exposure to fishing gear develop over time. Keeping fish trapped over a long period of time can cause its own harmful effects to the fish, which makes it hard to single out the effect of the catch from the effect of the chosen research methodology. Nevertheless, several studies have returned very high survival rates (95%+) for species caught on fly and lures, which generally tend to hook fish in the mouth and thus aid catch and release fishing. Proponents of catch and release also contend that the practice is increasingly necessary in order to conserve fish stocks in the face of burgeoning human populations, mounting fishing pressure, and worsening habitat degradation. Opponents would prefer to ban or to severely restrict angling, a suggestion most anglers find unpalatable. Catch and release recreational fishermen can have profound deleterious effects on fish stocks in commercial lakes, especially if the anglers have poor knowledge of how to protect the fish from damage or stress once they are removed from the water. The fish that suffer most in such practices are those of large, slow growing species such as carp. The only way for growing numbers of recreational fishermen to continue fishing is to reduce their impact on fish populations or to increase the fish populations (e.g. by restocking (although there are serious problems with restocking), restoring habitat, or improving stream flows). Catch and release, in combination with techniques such as strong tackle (to get fish in quickly, for release in good condition), careful handling of fish and barbless hooks (to reduce physical damage), and quick release lead systems such as the Korda quick release system or the E.S.P. variety may be useful tools in this effort. Barbless hooks reduce damage to minimal levels, reduce de-hooking time and greatly aid in catch and release. Many keen catch and release anglers use barbless hooks. Barbless hooks can be purchased, or created by crushing the barbs on a normal hook flat with a pair of needle-nosed pliers. It is popularly believed barbless hooks lead to more lost fish, but ensuring lures are equipped with split rings and keeping the line tight while fighting fish will reduce fish losses to levels similar to those of barbed hooks. Also using circle hooks will cause the least amount of damage to a fish. The circular design of the hook is very simple. When a fish bites the bait, the hook's design causes it to hook in the side of the fish's mouth every time. This makes it very easy to remove the hook with minimal damage. Setting your hook when a fish bites is also different, instead of snatching your line you slowly set your hook. This alone is a lot less stressful on the fish. 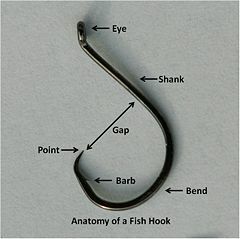 A circle hook is the best choice for catch and release programs. A recent phenomenon of recreational fishing is the proliferation of fishing competitions (tournaments) where fishermen compete for prizes based on the total weight of a given species of fish caught within a predetermined time. This sport evolved from local fishing contests into large competitive circuits, especially in North America. Competitors are most often professional anglers who are supported by commercial endorsements. Other competitions with mandatory catch and release are based purely on length, with either the longest fish or total length being documented with camera and a mandatory sticker. Given the greater ease of measuring length in comparison to weighing a living fish accurately in a boat the competitions based on length are considered fairer by many anglers. Big-game fishing describes fishing from boats to catch large open-water species such as tuna, sharks, and marlin. A recreational angler who does not own a boat has several options for going out on the water. These include: renting a skiff; chartering a boat driven by a licensed captain; or going onto a party boat, in which a licensed captain takes a party of usually unrelated anglers out fishing. Since fishing requires knowledge about local fishing grounds and current fishing situations, chartering a boat or joining onto a party boat has advantages. Good charter boat captains and party boat captains have professional knowledge, experience, and awareness of current fishing conditions. A boat owner wanting to fish in unfamiliar waters may be able to hire a professional guide who is familiar with local fishing spots and current fishing conditions. A guide is more popular in freshwater fishing than saltwater fishing. Sport fishing (sometimes called "game fishing") describes recreational fishing for which the primary reward is the challenge of finding and catching the fish rather than the culinary or financial value of the fish's flesh. The distinction is not completely rigid as in many cases, sport fishers will also eat their catch. The philosophies and tactics used for sport fishing, however, are usually sufficiently different from "food fishing" to make the distinction clear enough. Sport fishing methods vary according to the area being fished, the species being targeted, the personal strategies of the angler, and the resources available, ranging from the aristocratic art of fly fishing, ostensibly invented in Great Britain, to the high-tech methods used to chase Marlin and tuna. 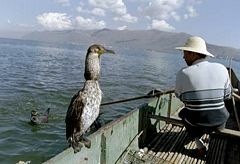 In virtually every case, however, the fishing is done with hook, line, rod, and reel rather than with nets or other aids. In the past, sport fishers, even if they did not eat their catch, almost always killed the fish to bring them to shore to be weighed or for preservation as trophies. In recent years, however, sport fishers' desire to improve the fishery has led many of them to adopt the practice of catch and release or even "tag and release" in which the anglers release their catch after first fitting their catch with identifying tags and recording their details as an aid to fisheries research. Sport fishing competitions give competitors—which are usually individuals if the fishing occurs from land and teams if the fishing is conducted from boats—a specified time interval for fishing and a defined area from which they are to catch fish. Scores are awarded for each fish caught, with points being apportioned depending on the fish's weight and species, and then, sometimes, divided by the strength of the fishing line used (so catching fish on thinner, weaker line scores additional points). In tag and release competitions, a flat score per fish, divided by the line strength, is awarded for each species caught. Commercial fishing provides a large quantity of food to many countries around the world, but those who practice it as an industry must often pursue fish far into the ocean under adverse conditions. Commercial fishermen harvest almost all aquatic species, from tuna, cod, and salmon to shrimp, krill, lobster, clams, squid, and crab, in various fisheries for these species. Commercial fishing methods have become very efficient using large nets, sea-going processing factories, and sophisticated fish locating devices. 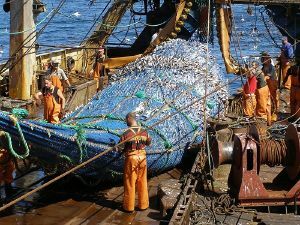 Many new restrictions are often integrated with varieties of fishing allocation schemes (such as individual fishing quotas), and international treaties that have sought to limit the fishing effort and, sometimes, capture efficiency. Commercial fishing gear today includes surrounding nets (e.g. purse seine), seine nets (e.g. beach seine), trawls (e.g. bottom trawl), dredges, hooks and lines (e.g. long line and handline), lift nets, gillnets, entangling nets and traps. In addition to the above, commercial fishing can also be thought of as encompassing "pay to fish" enterprises, which provide anglers with controlled access to stocked lakes, ponds, or canals. These provide fishing opportunities outside of the permitted seasons and quotas applied to public waters. In the United Kingdom, commercial fisheries of this sort charge access fees, with prices ranging from £2 to £25 per day. 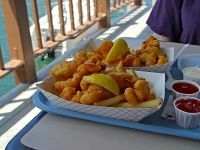 In North America, establishments usually charge for the fish caught, by length or by weight, rather than for access to the site although some establishments charge both types of fees. Prices for fish caught in North American "pay to fish" waters are generally in the range of $0.10 to $0.20 per centimeter or from $5.00 to $10.00 per kilogram. Boats and fishing equipment are under continual development toward the intention of improving not only the efficiency of the fishing but also its environmental sustainability. Some commercial fishing companies, for example, are developing nets designed to harvest only larger fish and release smaller ones to retain fish population. Recreational fishing equipment manufacturers are also developing naturally degradable fishing lines to help preserve healthy aquatic environments. A wide variety of types of boats and fishing equipment, from private to commercial, are available, depending on the purpose and type of fishing. Ancient methods of preserving fish included drying, salting, pickling, and smoking. All of these techniques are still used today, but for commercial applications they have been supplanted by the more modern techniques of freezing and canning for many fish species. Historically, the fish curing methods of drying, salting, smoking, and pickling, were used both as separate processes and in various combinations. On sailing vessels, fish were usually salted down immediately to prevent spoilage, but today's swifter boats commonly bring in unsalted fish. Salmon: smoked salmon]], [[cured salmon, and gravlax (fermented). Canning, developed during the 19th century, has also had a significant impact on fishing by opening the way for exploiting seasonal catches of fish such as sardines that can be far from large centers of population. While many kinds of fish are valued primarily as a source of food, many non-fish aquatic animals also are important food sources. These include squid, octopus, clam, mussel, oyster, winkle, scallop, shrimp, lobster, crayfish, and crab. The eggs of certain fish and marine invertebrates are edible and are called roe. Sea urchins, shrimp, and sturgeons are among the main sources of roe. In some cultures, roe, such as caviar from the sturgeon, is considered to be a delicacy. Live fish collected for the international live food fish trade often end up in an aquarium at a seafood restaurant, where the fish are kept alive until they are killed only immediately before being cooked. 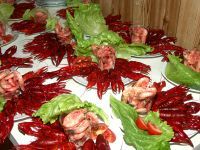 Suiting customer preference, this practice makes the seafood higher in quality and better in taste. The prevalence of cultural beliefs and consumer standards helps to drive the demand for the live food fish trade. Live fish can be collected in ways that do not injure them by using especially a seine net or an electric current placed in the water. Such techniques are used most often by researchers for observation and study but are also used by those who collect fish for the aquarium trade. Several organizations are devoted to improving the methods of collecting, handling, transporting, exporting, and farming wild and domesticated live food fish, as well as freshwater and marine tropical fish destined for aquaria. Sharkskin and rayskin which are covered with, in effect, tiny teeth (dermal denticles) were for one period used for the purposes that sandpaper currently is used. These skins are also used to make leather. Sharkskin leather is used in the manufacture of hilts of traditional Japanese swords. Sea horse, star fish, sea urchin, and sea cucumber are used in traditional Chinese medicine. Fish glue is made by boiling the skin, bones, and swim bladders of fish. Fish glue has long been valued for its use in all manner of products from illuminated manuscripts to the Mongolian war bow. Isinglass is a substance obtained from the swim bladders of fish (especially sturgeon); it is used for the clarification of wine and beer. Fish emulsion is a fertilizer produced from the fluid remains of fish processed for fish oil and fish meal. Although fishing is a widely used as a metaphor the usage can sometimes be ambiguous. On the one hand, fishing with a net has nuances of gathering by honest effort. For example, in the New Testament, Jesus is reported to have said to his disciples: Follow me, and I will make you fishers of men. Matthew 4:19. On the other hand, fishing with bait or lure sometimes has nuances of catching by deception, possibly with an implication of greed on the part of the victim. For example, the expression "fishing expedition" (usually used to describe a line of questioning), describes a case in which the questioner implies that he knows more than he actually does in order to trick the target into divulging more information than he wishes to reveal. Other examples of fishing terms that carry a negative connotation are: "fishing for compliments," "to be fooled hook, line, and sinker" (to be fooled beyond merely "taking the bait"), and the internet scam of Phishing in which a third party will duplicate a website where you would put sensitive information (such as eBay or a bank site) in order to obtain it. 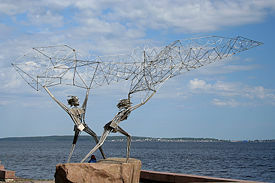 Statue of fishermen in Petrozavodsk, Russia. If you want to be happy for one hour, drink liquor. If you want to be happy for three days, marry with someone. If you want to be happy for one week, raise a cow. But if you want to be happy for a whole life, do fishing. Henry David Thoreau, American author. ↑ Early humans followed the coast, BBC News article. Retrieved September 19, 2016. ↑ Coastal Shell Middens and Agricultural Origins in Atlantic Europe, University of York and Heritage Media. Retrieved September 19, 2016. ↑ Image of fishing illustrated in a Roman mosaic, G. Mermet/Bridgeman Giraudon. Retrieved September 19, 2016. ↑ Polybius, Histories, Fishing for Swordfish, Greek and Roman Materials. Retrieved September 19, 2016. ↑ Trout binning in The Mirror of Literature, Amusement, and Instruction, Vol. 12, Issue 328, August 23, 1828, Project Gutenberg. Retrieved September 19, 2016. ↑ Image of an eel spear. Retrieved September 19, 2016. ↑ Spear fishing for eels, The Journal of Antiques and Collectibles. Retrieved September 19, 2016. ↑ Big Dropper Rigs, Paul's Fishing Kites. Retrieved September 19, 2016. ↑ Jared Diamond, Guns, Germs, and Steel: The Fates of Human Societies (W.W. Norton & Company, 1997, ISBN 0393038912), 310. ↑ Ajumawi Fish Traps, PrimitiveWays. Retrieved September 19, 2016. ↑ BAKA PYGMIES Culture, music and rites of initiation in the Central African rainforest, Mauro Campagnoli. Retrieved September 19, 2016. ↑ The Text of Magna Carta, The British Library Board. Retrieved September 19, 2016. ↑ Shooting and Fishing the Trent, University of Leicester. Retrieved September 19, 2016. ↑ De Orbe Novo, Volume 1, The Eight Decades of Peter Martyr D'Anghera, Project Gutenberg. Retrieved September 19, 2016. ↑ Ethnozoology of the Tsou People: Fishing with poison, TK Research Project. Retrieved September 19, 2016. ↑ Fishing in Ireland, Central Fisheries Board, Ireland. Retrieved September 19, 2016. ↑ Specimen Awards Presentation Photographs, Irish Specimen Fish Committee. Retrieved September 19, 2016. Pennsylvania Fish & Boat Commission. Take Me Fishing at a Family Fishing Program. Harrisburg, PA: Pennsylvania Fish & Boat Commission, 2007. United States. Fish and Marine Life. Washington, DC: U.S. G.P.O., Supt. of Docs, 1992. United States. Fisheries Management: Core Principles and a Strategic Approach Would Enhance Stakeholder Participation in Developing Quota-Based Programs: Report to Congressional Requesters. Washington, DC: U.S. Government Accountability Office, 2006. United States. Fishing. Ironwood, MI: Ottawa National Forest, Forest Supervisors Office, 1996. The State of World Fisheries and Aquaculture, Rome: FAO Fisheries Department, FAO (Food and Agriculture Organization of the United Nations). The Compleat Angler at Project Gutenberg. This page was last modified on 12 April 2017, at 15:35.